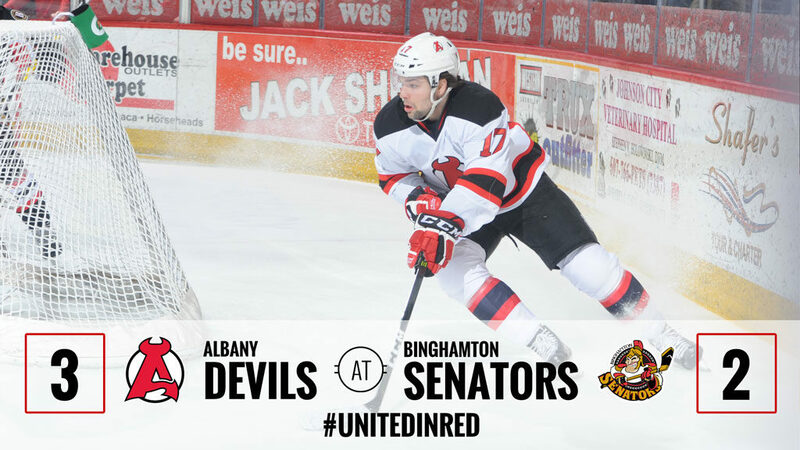 BINGHAMTON, NY – John Quenneville’s third round shootout goal gave the Albany Devils a 3-2 victory over the Binghamton Senators Friday at Floyd L. Maines Veterans Memorial Arena. 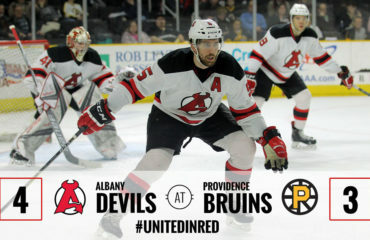 The Devils improve their record to 33-25-1-1. The Senators move their record to 24-32-2-2. Jason Akeson got the Senators on the board first at 1:14 of the first period. It was a tic-tac-toe play from Francis Perron to Kyle Flanagan who fed Akeson the pass to slip one past Devils netminder Mackenzie Blackwood. 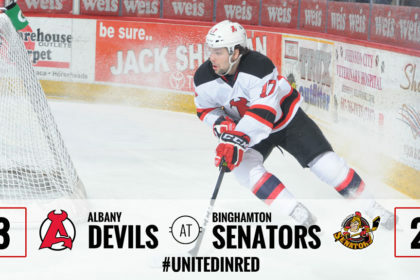 Former Albany Devil Brandon Gormley netted the Senator’s second goal at 10:41 of the period. Casey Bailey and Jack Rodewald earned the assists on the play. 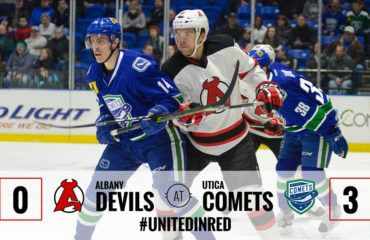 At 2:59 of the second period, Ryan Kujawinski got the Devils on the board off a rebound from an Andrew MacWilliam shot. Josh Jacobs was credited the secondary assist. Jacob MacDonald got the equalizer with 1:19 remaining in the second period to score his fifth professional goal. Blake Pietila and Carter Camper got the assists. Blackwood turned aside 14 of 16 shots and improves his record to 12-10-2. Binghamton goalie Matt O’Connor blocked 41 of 43 shots and moves his record to 12-14-2. 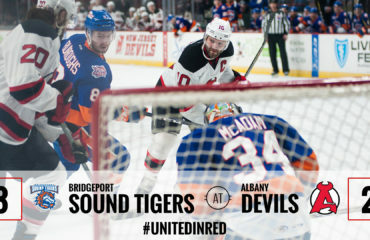 The Devils conclude their 6 game road swing in Bridgeport Saturday as they face off against the Sound Tigers at 7 pm at Webster Bank Arena.